Available in three colors, Pearl White, Blush Gold and Graphite Gray. 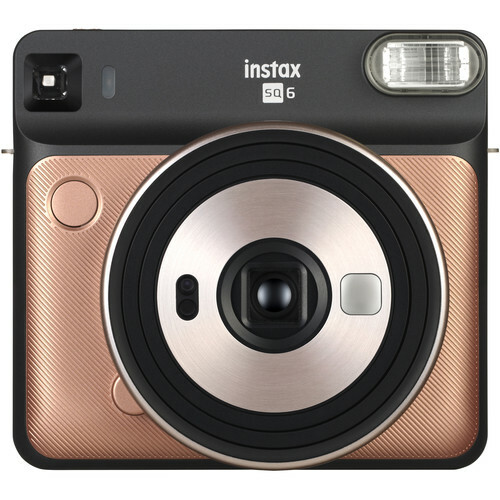 Compatible with FUJIFILM INSTAX SQUARE film (purchased separately). Picture size – 62mm x 62mm/2.4in. x 2.4in. Retractable lens, 2 components, 2 elements, f = 65.75 mm, 1:12.6. Inverted Galilean finder, 0.4 x, with target spot. Three motor driven focus modes: Macro Mode (0.3m – 0.5m/1ft. -1.6ft. ), Normal Mode (0.5m – 2m/1.6ft. – 6.6ft. ), Landscape Mode (2m/6.6ft. and beyond). Programmed electronic shutter release, 1.6 sec – 1/400 sec. Automatic, Interlocking range (ISO 800): LV 5 – LV 15.5, Exposure compensation: ± 2/3 EV. Electronically controlled self-timer with approximately 10 second delay LED display with Shooting mode (auto, selfie, macro, landscape, double exposure), brightness adjustment, flash suppressing and self-timer mode. Two CR2/DL CR2 lithium batteries. Capacity: Approximately 30 INSTAX SQUARE 10-pack film packs with new CR2/DL CR2 lithium batteries. Tripod socket (tripod sold separately). Fujifilm Instax SQUARE SQ6 Announced: the First SQUARE Format Analog Instax Camera posted on Camera Times on May 15, 2018 8:55 am .